People say Eger is "a small jewelery box". The castle of Eger is a national memorial site and a half-day program itself, but there are other museums, churches, Turkish memorial constructions that are waiting for you. The innercity has interesting structure: curvy streets, closed courtyard are interesting locations. It is good to search the places which you can visit. If you like stories look for a tourguide and a thematic tour! In the Castle of Eger István Dobó castle museum offers many interesting exhibitions for the visitors. In the Gothic palace we can get to know the story of the castle, in the casemates we can walk around in the cellar system which was built in 1570 and of course we can get closer to the heroes of the Star's of Eger book. In Eger there are lots of special museums: Archbishop's Palace, Magic Tower, Gárdonyi-house, and - also for children - Fireman Museum, Marcipania. Adventures, dissemination of knowledge in various ways. If you like legends, stories, that are neither on the internet nor on walls of museums and not even in guidebooks then look for a tourguide! There are stories spreading from generation to generation amongst the tourguides in Eger, rely on the locals. Eger as an archdiocese has a significant religious life and religious traditions. In the innercity you can reach 9 churches with a short walk. Start your walk with the Basilica which was built in Neo-classicist style and it is the most important religious building in town. If you choose any of the small windy streets you will reach Dobó square. Here you can find a the impozant baroque Minorite church which was built in honor of Saint Antony of Padua. In Eger you can find many interesting things if your eyes are wide open. Wrought iron coats of arms, monuments, memorial plates, statues.. It would be nice to know the history behind, why they are there, what they are famous for, who created them and when? We have collected a few curiosities and you can get even more information from the tourguides. The historical innercity is made up of walking streets. Discover the sights, coats of arms, and the beautiful frontispieces. Eger lies in a picturesque area. Every direction you go you find small villages and even places of the world heritage! Discover as many as you can: Szilvásvárad, Bélapátfalva, Noszvaj, Felsőtárkány, Mezőkövesd, Lake Tisza. 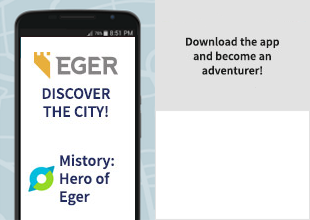 Eger Settlement Repository – an inventory of cultural, built, industrial, natural, health values, local personalities considered important by private people, institutions, businesses.